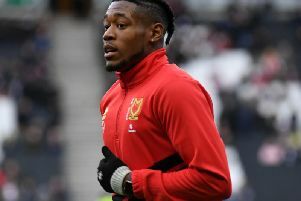 Has a year made a difference for MK Dons? A year ago, MK Dons fans were picking through the bones of a disappointing 3-0 home defeat to Southend but they already sensed it was the end of an era - Karl Robinson left the club later that day after six and a half years in charge. Fast forward 12 months, there's a new man in the dugout, new faces on the pitch and a new approach to the game. But has it made a difference? When Robinson departed, Dons were sat 19th in League 1. Dumped out of the Championship, they hadn't won in nine months at home and looked a team worn down, broken and in desperate need of repair. Robbie Neilson's task when he arrived in December was to keep the team up, and he succeeded. He turned around the home record at his first attempt as he beat AFC Wimbledon, and while there were potholes along the way - including losing the first meeting between the two sides at the Cherry Red Records Stadium - Dons finished in the top half of the table. A summer of rebuilding saw almost an entirely new squad assembled as Neilson took charge of his first full season at Stadium MK, but so far, it is yet to find it's feet. Dons are 15th in the table, having stuttered through August, strolled through September and stumbled again in October. Saturday's dramatic 4-4 draw - which featured just two of the players who saw the end of Robinson's era - kept Dons within four points of the play-offs, but the manager feels his side have thrown away points by drawing the last two - a case of what might have been. While the second half saw Dons mount a comeback that will be spoken about for years though, Neilson was met with a similar chorus of boos at half time which serendaded Robinson against Southend. But of course, so much has changed in the last year. The squad Neilson inherited had arguably reached it's sell-by date in the Championship but limped back to League 1 with the intent on finding their way back but got considerably lost along the way. Neilson, now at least, seems to have the framework to build on - a framework he put together. Irrespective of a few months together, Neilson's is still a team in transition, and there are seldom quick fixes in football when you change an entire culture unless you chuck untold millions at the problem. There's still an air of the unknown about the team and the best 11, if there is such a thing, hasn't been out on the pitch all at once yet. Form has been patchy, performances have come in fits and spurts rather than across a 90 minute period and those looking for a Saturday flutter are best to avoid laying down any hard earned on the men from MK1. Dons are predictably unpredictable. Some things have remained the same, then, as has the seemingly unwavering belief the club is destined for the Championship next season. However, with three midtable League 1 finishes from their last four campaigns at this level, this may just be Dons' position in the natural order.